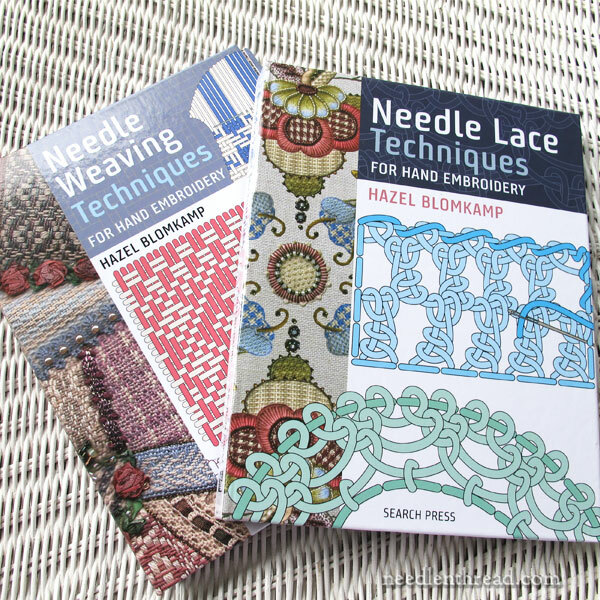 Last year, I reviewed Hazel Blomkamp’s handbooks on needle weaving and needle lace techniques, which she was offering on her website as self-published booklets. Just a heads up! Both books are now being published by Search Press! I’ll show them to you here, let you know what’s different about them and where you can find them, and then we’ll chat a bit about needlework books in general and I’ll share a bit of upcoming news with you. Read on, read on! If you’re keen to know what kind of content is in both of these handy “work books” by Hazel Blomkamp, please read my review of them from last year. While the instructional content in the books hasn’t changed, there are a couple notable features in the books now published by Search Press. I’m a pretty big fan of this type of “half Canadian binding” on instructional needlework books. 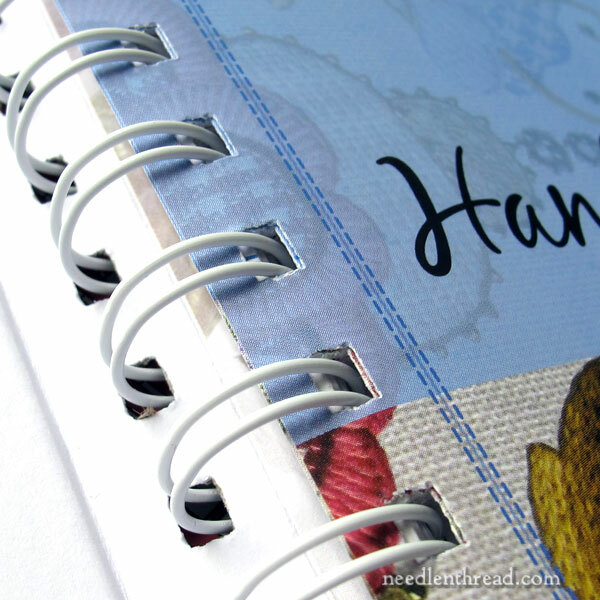 The wire binding allows the book to lie flat on open on your work table, so that you can easily reference the book while you’re stitching. This type of binding allows for printing on the spine, so that it’s easy to see the title of the book while it’s on the shelf, but it offers all the convenience of a wire-bound book, when it comes to using the book. The books are hard board covers with a glossy finish. They’re very sturdy, and they’re small enough to slip into a project back or basket for easy reference. On the new editions, you’ll find that only one side of each two-page spread is printed, so that there’s a blank page to the left each time you turn the page. While it’s tempting to write this off as wasted space in the printed books, in fact, if you’re using instructional books as a work book, there’s nothing better than blank pages. This is where you can take notes on things that work (or don’t work) for you while practicing the techniques, and where you can work out your own stitch patterns and save them for future reference. I’ve always been a fan of having at least one blank page in instructional books, for note-taking. Since most books don’t have blank pages in them, I resort to an inordinate amount of post-it notes, which are never really permanent, and can be hard to keep track of. With blank pages throughout these two books, you can truly treat them like work books, with the instruction on one side and room to note your own experiences and experiments on the other. I’ve listed where you can find both books on the original book review article here on Needle ‘n Thread. Just scroll to the end of that article for the list of available sources! This year, I’ve not really reviewed that many needlework books, although quite a few good ones have been published! As the year comes to a close, I’ll be reviewing a few more of my favorites from 2017, so that you can make informed decisions about adding them to your library or your wish list. In fact, the whole purpose of my book reviews is so that you can know what’s in a book and see how it can help you, before you buy it. I like to list pros and cons, and in some cases, I like to supply alternatives that might serve you better for particular techniques or topics. I’m in the process of updating my Books page, where you’ll find a whole slew of needlework books I’ve already reviewed and links to those reviews. I haven’t updated that page in a while, and I’ll be adding quite a few more review links over the next two weeks. My plan is to restructure that page and divide the books by categories and techniques, rather than listing them in alphabetical order. I think more people search for books by specific techniques or topics, rather than by title, don’t you? So I’m working on that! If you have any insights about how you think the book page on Needle ‘n Thread should be arranged, feel free to weigh in with your thoughts below! Coming up on Friday, I’ve got a delectable embroidery thread give-away for you! Keep an eye out for that – it’s a great way to build your stash and to enjoy the experience of new threads that you may not have tried yet! January 11, 2016 Needle Woven Fillings: a Huge Variety of Them! It’s a bit confusing having the same books with different covers and bindings. At least the titles are the same, I’ve bought duplicate books by accident when they had different titles. I think I like the new bindings better, I like having the titles on the spine. An I agree with the blank pages. About your book review organizing, I have my books somewhat organized by technique, so I’d tend to agree with you listing them like that. I can also see wanting to search by author and maybe publisher as well. That way we could find out all the Hazel Blomkamp or A-Z series books you’ve reviewed for example. And a warning if, like these 2 books, there are re-prints by different publishers. I suspect I’m getting away from your idea of a fairly simple list though… I do hope you keep your ratings in any event. I must correct my comment on my book organization, I used to have it organized by type of embroidery, over the years as it’s expanded, it’s devolved into organized by counted, not counted, multitude of techniques (like a reprint of the Dilmont needlework book), and a “won’t fit on the shelves” pile. Thank you, Mary, such interesting information in this post and the earlier post. Question: do you think these surface weaving stitches could be done on needlepoint canvas on stretcher bars? I think it might be too difficult on a tight canvas that cannot be “bent” to do the weaving, but weaving on surface would allow one to do patterns free from the restrictions on the canvas holes, which could be exciting. Did you try it with fabric tight in a hoop? Yes, absolutely. It really needs to be done stretched taut, or the threads probably wouldn’t lie as straight on the ground fabric, or the canvas. Mary – Here’s a thought….I have a beautiful necklace that I bought in Lanesboro, MN from a woman who owns a shop there called the Black Crow. All of the things there are hand made. This particular necklace was created by looping around a very flat stone. Waxed linen was the looping material and she created a little basket in which the stone hangs…..thus a necklace. I thought it might be cool some day for you to show that it isn’t always necessary to use fabric and string together. A stone and string makes a piece of wearable art. And the conversations that have taken place with even strangers has been a real treat, I’d say. Would you like me to send a picture of the necklace to you so you can see what I’m talking about? p.s. It’s about time for a health update from you for those of us who think of you every day…..
I’ve not posted much–just a couple of resources I added to the mix, but I recently resolved to become a more regular part of the community, as I am a devoted reader and a constant and grateful user of Mary’s clear and generous Needle’nThread wisdom. I have been so often astonished by the resources and possibilities and new stitches and threads and tools and and and… I guess I have been one of those shy ones in the corner! As so many say, Mary has become a real embroidery “friend” though far off, but so too have many of the regular posters. I feel a kinship to several and as I have no needlework buddies in my area, often wish I could meet some of you in person. Anyway, today’s news about Hazel’s books being more easily available online now, finally prompted me to post. Thank you so much for this head’s up, Mary! I have looked at them at her website but didn’t want to pay the international postage. I even vaguely wondered if they would show up in broader publication someday. Now they are on my list and I look forward to ordering them in due time. So many skills and projects…so little time…but so much dreaming! And so much encouragement! Thanks again, Mary and the Needle’nThread community! I do like this kind of binding as it lies flat on a surface and is easy to follow the instructions and like the fact that they are small and can easily fit into a small space. Good idea on the book page organising into categories and techniques this is very helpful when searching for a particular format. Thanks for letting us know of the new edition of the Hazel’s books and for updating your book page. Looking forward to the give-away on Friday happy stitching til than. I just received these two books from Hazel’s website. They are great. I am stitching her “Owlfred” design and have found the info in these books very helpful. I like to buy directly from the designer when possible. I have had trouble remembering which direction is Warp and which is Weft. It finally dawned on me that Weft has the letters W & E in it … thus West to East or horizontal. Now I am not likely to forget which is which. Thanks for your great book reviews, they have been very helpful for me to select books for my library. Hi Alice, had the same problem with Weft & Warp when I began weaving a couple of years ago. Had to smile when I read you did the West and East memory jogger. That’s what I still do!! I really appreciate your book reviews, and usually will buy on them. When almost the only way to buy such specialized books is on line, it can be difficult to know whether they are worth it or not. I have quite a few books on my shelves that I think are not worth the money especially if they come from overseas, once I see them, but I am much better informed after reading your reviews and don’t think I have regretted any you have reviewed. I try to organize my library by technique, I think that is a great idea, Mary. While I wouldn’t organize my library this way, it is very handy at times to see a list by author in alphabetical order. I always enjoy reading your book reviews – you have lured many dollars out of pocket and pages onto my shelves, and I regret none of those purchases. I agree, organise by topic, but if you can please make the list searchable by title and/or author. Thank you Mary for the update. I really need a good needlelace book to do a special embroidery project. Ordered it through Book Depository. I think ordering by technique is an excellent idea as if I’m interested in learning say, Goldwork, it is nice to have an easy comparison of the different options in one place. As regards searching by author or publisher, that is also helpful … perhaps if you added those details as tags it might make it more easily searchable. I’m not sure what your blog page template allows … but if you could have a ‘if you liked this you might like that’ thumbnail display of other books by the same author or publisher, that might be a user friendly way of displaying that information for those who want it. Hi, Kathryn – Those are good ideas, thanks! Normally I read and enjoy, but I could not resist these books. Now I have to wait for a week for them to be delivered through Amazon. I have been interested in needle weaving and needle lace for many years, but have not been able to manage to try it. I have failed at tatting and learned to crochet and knit enough to make belt loops and a basic scarf, but I am hopeful that needle lace will be my new cup of tea. BTW, I like the idea of organizing books and papers by category instead of alphabetical. I should just take a week to clean and sort, but it won’t happen now until after Christmas. No matter how/when it is done, being organized makes your job easier and your studo space more comfortable, not only for you, but your guests and students who come by as well. Time to get busy! G’day Mary, getting cold there I reckon? Warming up for a summer that is possibly to be scorcher. No happiness for many there. No doubt those on road out of town will leave sooner. But more people leave because of the cold. Either way not something to contemplate. Hazel Blomkamp’s books and designs are great. Especially as these new books have the spiral spines. As you say it is so much easier and keep the books in a better and kinder state. Some where in my dim brain I think it was mentioned that they could be given a different spine, back to a usual type of spine. I dare say it is due to the cost of manufacturing. Country Bumpkin(Inspirations) and their little how to books went the same way. Still Hazel and Inspirations books are well worth it. What is not expensive with embroidery these days. At least embroidery gear lasts, not like today’s toys or clothing etc. We have become the throw away society. Even with people. Your brought to mind your article and the embroidered multiple lattice stitches design. I really like that one of yours. I thought it was really good as a practice sampler. Now I keep it in my sampler book. It is a favourite of a 6 year old lad across the street. He is very bright and we do reading and writing. So now we do reading, writing and embroidery. His elder sister has shown an interest the embroidery so I might have 2 working the needle. Both the children are tall and big for their ages as they are Tongan. The are moving from New Zealand. I am so pleased to see children about the place. It was a very big smile day when I offered to help them with their reading and now I could have 2 ready to sew. I am glad to be in summer. I can turn off my fake sunlight lamp. Not one to give you sunburn tho. It helps to keep the glums away. I first heard about using this light when Sweden and the UK were treating their patients for depression with such a light. Just added that Mary as you do have long and cold winters. Happy sewing and many thanks for the great newsletter. Thanks, Martha! Funny thing – the lamp I use is also sold just for light therapy, apparently. I got it because I like the quality and level of light, but I can see how it would definitely keep the winter blues away. We don’t have too bad of a winter here in Kansas – it can get very cold, and we occasionally get snow or ice, but nothing as drastic as the east coast or the northern states. I love winter, though – until I’m sick of it and spring starts teasing! Sounds like you’re doing great work with the kids – that’s terrific! So glad you like the lattice sampler! I received this book from Amazon – sent the first one back and am contemplating sending the replacement back. Yes, the even-numbered pages are blank and the odd-numbered pages have the stitches, but some of the stitches are missing. For example, Stitch #11 is on p. 39 and Stitch #13 is on p. 41. Where is Stitch #12? I have similar issues with Stitches #18-21 and Stitches #28-32 missing. What am I missing?? I tried contacting the publisher, but there has been no reponse. Otherwise, this is a terrific book to have (if it weren’t for those pesky missing stitches) as my needlework skills have progressed over the years. I don’t think it is a printing error or anything missing. It is the way Hazel numbered her stitches/patterns and decided which ones to share in her books. For example; in her book crazy Patchwork she shares quite a few needle lace stitches 1, 2, 5,7,8,15, and 34. 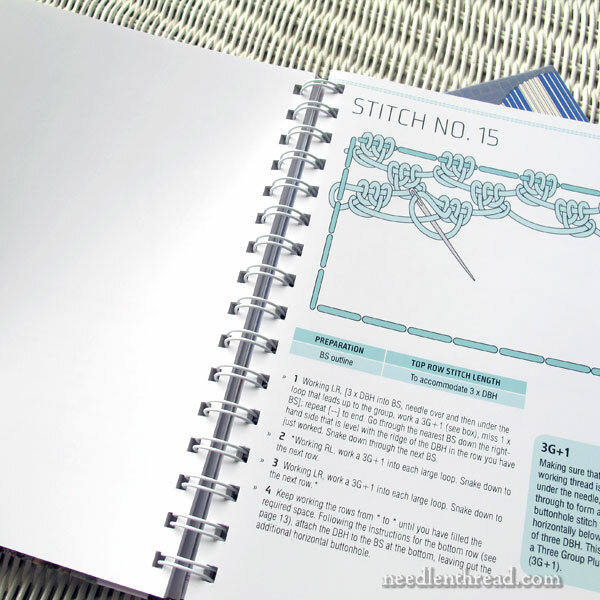 Next Next post: Boost Your Embroidery Stash! A Thread Give Away!